Welcome to the Gulf of Mexico’s best kept secret. Saltwater fishing charter destinations. Join us for an exciting day of deep sea fishing, with a multitude of options, sure to leave everyone with fantastic memories and Big Fish stories galore! If fishing is your passion, we offer world class Fishing by Reel 1 Up Fish and Dive Charters. Trips range from backwater and offshore fishing on one of our fleet vessels that can take one to six people. We also offer specialty fishing trips, night fishing and long range fishing from one of our Sport Fishing Yachts. How do I know what fishing charter is the best for me and also has the best value? The first thing you may like to do is to have all the following information available when you call to book your fishing trip; 1. How many persons are in your group and what are their ages? 2. Are you looking for a day of backwater fishing on a smooth brackish estuary off the Gulf of Mexico, or would you rather brave the sea and book an offshore charter with a wider variety of species and success? 3. How long would you like to be on the water? We offer trips from four hours up to an entire week of fishing excitement depending on your plans. 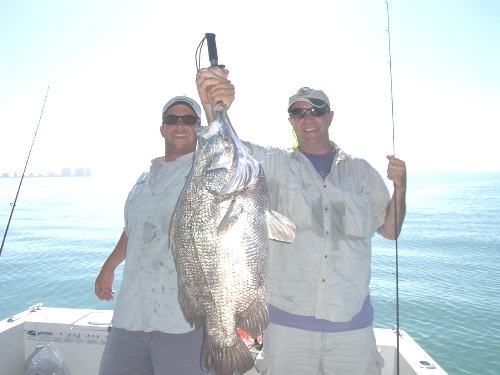 Naples Marina and Excursions takes great pride in our professional fishing charter services. Beginning with the proper equipment for the job, not only do we supply the top of the line gear for your trip, we also upkeep our vessels to the highest standards. You can rest assured, that you will be boarding a very clean and maintained fully operational boat. Equipped with GPS and current navigational systems as well as all certified coast guard required devices and more. In the event of an emergency our crews are certified professionals experienced in dealing with any type of water situation. We are members and partners with the local Tow Boat US and Sea Tow Rescue Services which stand prepared at a moments notice. Full moon and night trips are a great way to take advantage of Florida’s cooler climate as well as catching night feeding fish. It is proven that certain species of fish feed more at night during the full moon cycle because of stronger tides. We will target snook, tarpon, grouper, lane snapper, yellowtail snapper, mangrove snapper, mutton snapper, shark, and permit. Combination trips are a great way to knock out several peoples interest all in one trip. Kids and non-anglers get bored of watching us enthusiastic angler’s having our fill of fun. This trip you can pick between fishing, sightseeing, shelling, and scuba diving. Let the kids play and swim while the adults lounge on an island sipping on cocktails. Or set out and venture the island and find the awesome shells you won’t find on those crowded beaches. Take the plunge with the finest scuba diving and spear fishing the Gulf of Mexico has to offer. Visit the underwater life on our vast reefs and ship wrecks in all depths of water perfect for the novice and advanced diver. What ever you choose, everyone is sure to be pleased. For questions call one of our reservation specialists at 239-592-1200 our if you already have and need to book a your trip please click here . 6 hour trip $700 for 1-4pob add $75pp for 5th or 6th person. Trips that depart after 1pm add $100 to above rates. 10 hour trip $1200 for 1-4pob add $200pp for 5th or 6th person. 12 hour trip $1800 1-4pob add $300pp for 5th or 6th person. To book an extended trip more than 12 hours please call for availability and rates. Offshore trips are out to 9 miles off the coast depending on the length of the trip. 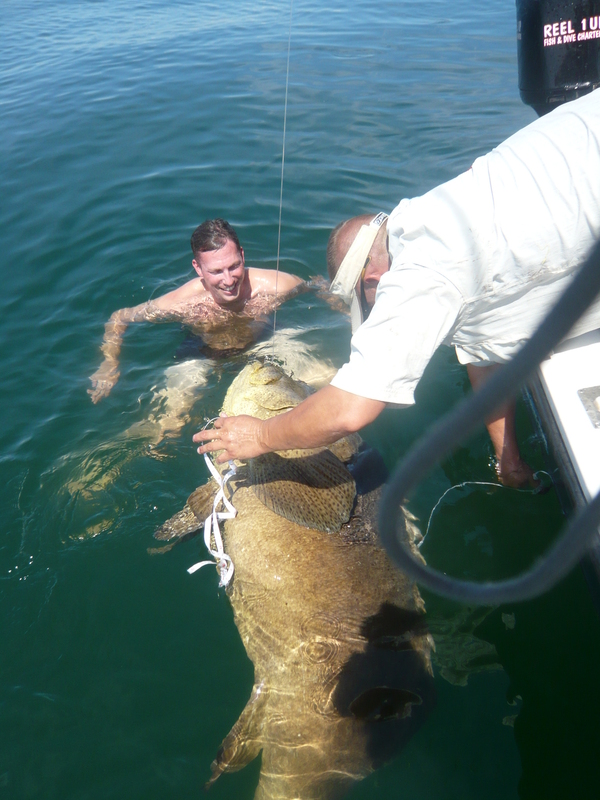 We fish various reefs, wrecks and bottom structure that offer a variety of fishing options. For the experienced angler, test your skills by casting lures or if you’re just a beginner bottom fishing baits is always a good way to go. If you are looking for that fish of a lifetime opportunity this is the way to go. We specialize in putting you on big fish and will do what it takes to make sure you get a chance to experience what drag screaming is all about. Offshore past 9 miles cont’d.. If you are looking for a long range trip in the 20-40 mile range or further we can customize this trip to target select species of fish whether for game or table fare. These trips run eight to twelve hours in length and can be extended to accommodate your expectations. You can expect to catch several species of snapper from lane snapper, yellowtail snapper, mangrove snapper, mutton snapper, red snapper, gag grouper, red grouper, black grouper, amberjack, cobia, king mackerel, tuna, bonita, goliath grouper, sharks, and many other reef fish. The types of structure we fish range from natural coral bottom, ledges, wrecks, reefs, springs, which have been proven high activity spots which have been all dove by our dive team to ensure when we fish a spot there is no guess work to where the fish are at. To ensure the best success there are many factors to take in consideration from tide, barometric pressure, moon phase as well as many other factors. Our team will do everything possible to put all these conditions into play when choosing the best time to schedule your departure time and length of trip. Please remember we are not commercial fishermen and our main goal is to give you the best fishing experience possible while practicing conservation. Being fishermen ourselves we love to eat fish but in order to give you and all our clients the best trip possible we promote catch and release on all our trips with the exception to keeping that one right fish which may feed the entire party or only keep enough fish for everyone on board to have a fresh meal. We ARE NOT a kill boat and will not keep limits of any species as any full time, long term Captain would not. Our fishery can’t handle that kind of pressure. We leave that up to the commercial fishermen that fish areas far enough out that do not effect our fishing. For clients that want to keep more than enough for a meal, please request this type of trip which at that point we would put you on one of our long range commercial trips that would not have an impact on our recreational fishing spots. This is why we are so successful and why we catch big fish 90 % of the time. All of our charters are designed to give our clients an opportunity to catch that fish of a lifetime. We employ only the most qualified Captains for the type of fishing you will be doing. Regardless of your expertise our staff is trained to teach each fishermen new techniques which will ensure you have the best chance of landing that big fish and learning something new.